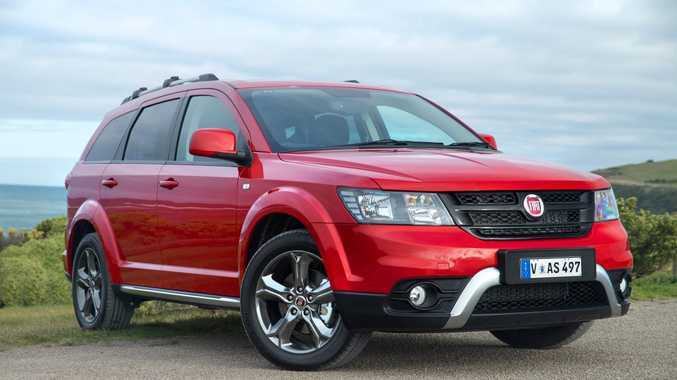 FIAT has added much-needed V6 power and some cool treatments to its Freemont SUV. The $36,500 Fiat Freemont Crossroad has a 3.6-litre V6 petrol engine under its bonnet, generating 206kW of power and 342Nm of torque. It also has a much tougher look, with a new front bumper with chrome colour inserts, glossy black front grille and fog light frames, chrome colour side skirts and roof rails, as well as the black frames for the front and rear light clusters, and the rear bumper with chrome colour under-body protective insert. Bold new looks are complemented by 19-inch burnished "Hyper Black" five-spoke alloy wheels. Fiat says the Freemont Crossroad combines all the strengths of an SUV - including space, style and driving position - with the best features of an MPV, like the seven seats, 32 seat configurations, 25 storage compartments and huge luggage space on board (up to a maximum of 1500 litres with second and third row seats folded down). The V6 is Fiat Chrysler Group's Pentastar 3.6-litre which has average fuel consumption of 10.4 litres/100km. Crossroad features include a 21.3cm Uconnect touch-screen satellite navigation system with maps, DVD player and SD slot, Bluetooth connection, rear parking camera and an Alpine Premium sound system with six speakers, 368-W amplifier and subwoofer, electric heated and folding door mirrors, six airbags, illuminated cup holders, Keyless Enter 'n Go with starting button as well as audio and driving speed regulation controls on the steering wheel. Snt passenger advanced multistage airbags, active headrests, electronic stability control with traction control system at all speeds and the Brake Assist system. What's more, side window airbags for all three rows of seats, airbags in the front seats, disc brakes on all four wheels, Isofix child restraint system attachment are also available.